"Barring a huge upset, Republicans will take control of at least one house of Congress next week. How worried should we be by that prospect?.. This is going to be terrible. In fact, future historians will probably look back at the 2010 election as a catastrophe for America, one that condemned the nation to years of political chaos and economic weakness... The economy, weighed down by the debt that households ran up during the Bush-era bubble, is in dire straits; deflation, not inflation, is the clear and present danger. And it’s not at all clear that the Fed has the tools to head off this danger. Right now we very much need active policies on the part of the federal government to get us out of our economic trap... So if the elections go as expected next week, here’s my advice: Be afraid. Be very afraid." Whoa. Somebody get that man a Prozac. 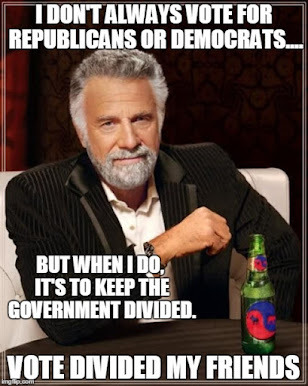 A Dividist's work is never done. After reading this, I started gathering resources to rebut, but found the article so incoherent and self-contradictory that I was struggling where to start. Fortunately The Economist made this job a whole lot easier. "Right now we very much need active policies on the part of the federal government to get us out of our economic trap. 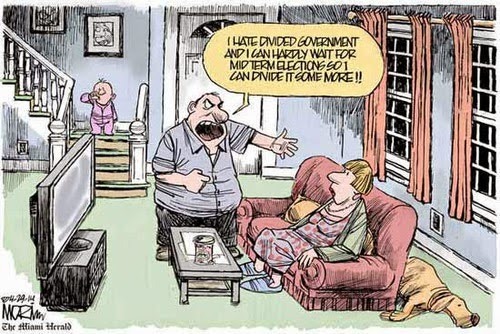 But we won’t get those policies if Republicans control the House. In fact, if they get their way, we’ll get the worst of both worlds: They’ll refuse to do anything to boost the economy now, claiming to be worried about the deficit, while simultaneously increasing long-run deficits with irresponsible tax cuts — cuts they have already announced won’t have to be offset with spending cuts." "It's a little sad, isn't it, when even our most eminent public intellectuals waste so much of their time, and ours, on baseless partisan freakouts?" I think that pretty much sums it up. Except for what Nike Gardiner at the Telegraph had to say. 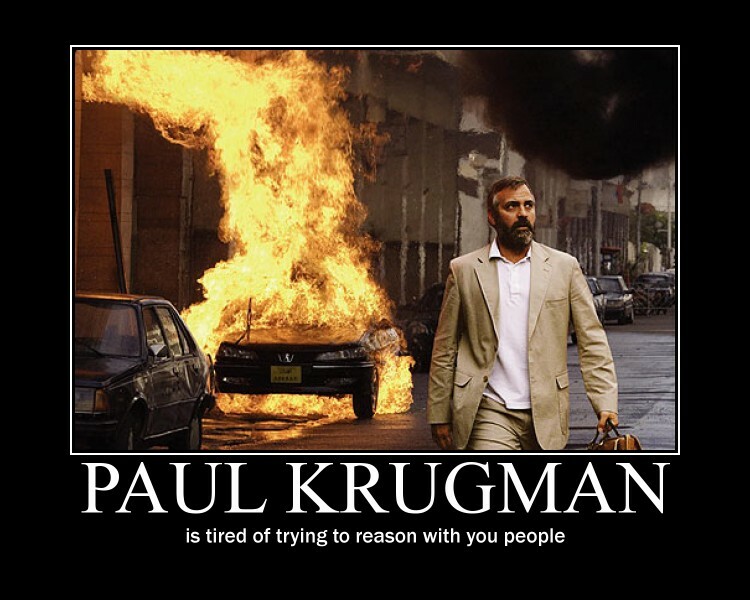 "Not only is Krugman’s article one of the most ridiculous pieces of scare-mongering in the history of modern American journalism, but it is the pathetic whimper of a decaying liberal Ancien Regime that is spectacularly crumbling. It also illustrates just how out of touch liberal elites are with public opinion, as well as economic reality. The tired old blame Bush line no longer works, and as a recent poll showed, the former president’s popularity is rising again." 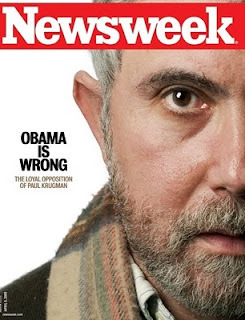 So what does it say when Krugman is sounding doomsday reports that the GOP winning Congress on Tuesday condemn America “to years of political chaos and economic weakness?” Let’s ask Krugman himself, circa 2000. In his essay “How to Be a Hack,” he sagely warned that it’s “still a good idea to tune out supposed experts whose minds are made up in advance.” I hope I’m not jumping the gun myself when I say that for once, Krugman’s advice sounds spot-on. "Hey, wait, I thought it was Democrats who liked to say Republicans are trying to scare us. Now, it's just Republicans are scary, and we hope you believe that they're scary to everyone, and not just to Democrats." "But far be it from me or anyone else to suggest that Krugman’s off his rocker when he says a Republican House of Representatives portends disaster. 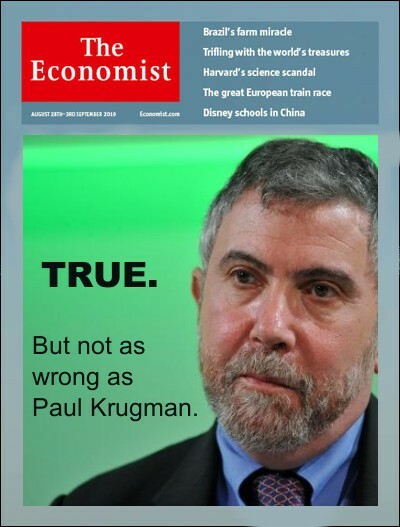 Birds gotta fly, fish gotta swim and Krugman’s gotta make terrible predictions. As we speak, he’s probably stroking his Nobel Prize and staring wistfully out the window — the leaves are pretty on Princeton’s campus this time of year — and contemplating the Xanadu we could have had if only we’d coughed up another trillion in stimulus. Let him indulge his fantasies. It’s better that way." To be fair, the comments quoted in response to Krugman's column are all from right-of-center columnists and bloggers. OTOH, Google could not find anyone of note from the left trumpeting or even defending Krugman's column. Methinks even his liberal brethren are embarrassed about this particular screed. Perfect. One big difference though - unlike Krugman, the Ghost Busters were right.